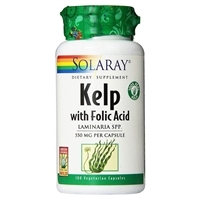 Kelp is helpful for healthy thyroid function, blood sugar management, weight management, skin health, bone health, and much more. Liquid Ionic Magnesium is a rich, concentrated liquid dietary supplement that provides magnesium in ionic form - the form most widely recognized by the body. Our proprietary process ensures maximum absorption, while the balanced liquid form provides safety and flexibility. Magnesium is required for cellular energy production. It participates in over 300 biochemical pathways in the body, including cardiovascular function. 15-day supply, 400 mg/serving of Magnesium from ConcenTrace. This product is not intended to diagnose, treat, cure or prevent any disease; the law applicable to dietary supplements, the Dietary Supplement Health and Education Act of 1994, commonly referred to as DSHEA, does not permit us to do so and it is not our intention to do so. The Contraindications and Potential Drug Interactions information provided on this website is not intended to be all-inclusive. Keep your healthcare provider informed about any herbal and other dietary supplement products that you are taking. Supports occasional indigestion, bloating, regularity, energy and optimum health, 1oz daily. Safe for children, adults, seniors, athletes, and even pets! Suitable for children, adults, and even pets. Recent research highlights the important health benefits of maintaining proper bone mass for a lifetime. Proper exercise and supplementation of calcium and vitamin D for those not getting enough in their diet can help promote healthy bones. Liquid Cal/Mag/Zinc is a perfectly balanced daily liquid supplement of calcium, magnesium, zinc and vitamin D synergistically formulated to support bone, muscle and connective tissue health. This fast-absorbing ionic liquid formula has a great Pina Colada flavor. It also contains ConcenTrace, a full spectrum ionic trace mineral complex of over 72 trace minerals and elements that help to aid in the absorption process. As an additional benefit, calcium, magnesium and zinc play an integral role in the body's energy generation and enzyme production at the cellular level. Introducing Liquimins, ionically charged liquid minerals from Trace Minerals Research. 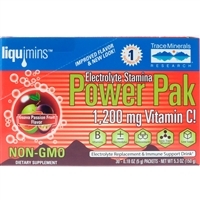 Surging with over 72 minerals and trace elements that your body needs for optimal health, Liquimins are absorbed quickly because they're liquid. And because the minerals are ionically charged, they increase the absorption of other nutrients, too. They're perfect for those who prefer taking liquid supplements rather than tablets. And with Liquimins you get all the health benefits of minerals and trace elements with the ease, convenience, and speed of a liquid supplement. Look for the Liquimins drop on the label and feel the difference a full spectrum of ionically charged minerals can make. Warnings & Disclaimers: Allergen Info: Contains derivatives from corn. Gluten free. Caution: As with any dietary or herbal supplement, you should advise your health care practitioner of the use of this product. If you are nursing, pregnant, or considering pregnancy, you should consult your health care practitioner prior to using this product. This product is not intended to diagnose, treat, cure or prevent any disease; the law applicable to dietary supplements, the Dietary Supplement Health and Education Act of 1994, commonly referred to as DSHEA, does not permit us to do so and it is not our intention to do so. The Contraindications and Potential Drug Interactions information provided on this website is not intended to be all-inclusive. Keep your healthcare provider informed about any herbal and other dietary supplement products that you are taking. ConcenTrace Trace Mineral Drops is an all natural mineral concentrate that's made by using ConcenFlo, our proprietary harvesting process. ConcenTrace contains over 72 naturally occurring ionic trace minerals from the Great Salt Lake with 99% sodium removed. Taking ConcenTrace every day ensures you're getting a full spectrum of ionic trace minerals, which are the same kind of bioavailable ionic trace minerals that are found in foods!